What Is a Car Title Loan? Is It Something You Should Consider? A car title loan is a product offered by certain financing companies. The premise is that you obtain a loan and in return, you put up your vehicle as collateral. You can apply for one of these loans online or at a physical location of loan companies that provide small personal loans. Usually, the loan is for a short amount of time and comes with a high-interest rate. In fact, you’ll often see APRs in the triple digits. You must submit an application for the loan just as you would with any other loan product. Most of the time, you’ll be asked to provide employment information and other personal details. However, the lender may not actually take the time to verify because they have the title to your vehicle to use as collateral. If you are approved, the lender keeps the title to your vehicle until the loan is paid off. The amount of the loan you are approved for depends on the value of your vehicle rather than your credit history. Lenders may offer loans from 25% up to 50% of the car’s value. In some cases, they may increase the loan amount even higher. They might also take photos of the vehicle to ensure it is in good condition. You must own your vehicle outright or at least have some equity in it for these lenders to accept your application. The lender often won’t consider a vehicle that already has a lien against it because gaining access to the title is more complicated. While these loans are criticized almost as much as payday loans because of their terms, they do offer people an option when they have no other. Most of the time, the lenders accept your application regardless of your past credit history. They may not even run a credit check. In addition, they may not verify any other information, which means you could be approved almost immediately. For people who are in need of quick cash, a car title loan may seem like the only option. In many cases, you receive the money the same day they apply. Traditional loans can take days or even a couple of weeks before you see the funds. Rather than taking out a payday loan or car title loan, it’s usually a better option might be taking out a personal loan. You can find our list of best personal loans for good credit here and our list of bst personal loans for bad credit here. There are several disadvantages to this type of loan. The most obvious is the high rate of interest. If you are in desperate need of cash, you may not think about the cost of the loan, but it is an expensive way to get the funds you need. Another issue with a car title loan is that it puts you at risk for losing your vehicle. High-interest rates translate into higher payments, so you are more likely to default on the loan. If this happens, you lose your vehicle. The lender sells the car to pay off the loan, and you are still responsible for any amount owed beyond what the sale brings in. If this happens, you really can be left in a worse situation than the one in which you started. If you are considering a car title loan, first rack your brains to come up with any other options. Try to find a lender who accepts borrowers with bad credit, or see if you can get a cosigner on a loan. You may be able to work with current creditors if you’re trying to use the money to pay off bills. The second thing to consider is how much interest you’ll have to pay on top of the loan amount and how much the monthly payments amount to. In many cases, the loan is only for 30 days with the option to renew if you can’t pay it in full. Look at the details and think about when you are realistically going to be able to pay off the loan. You’ll want to figure out your budget to make sure you can afford the payment so that you don’t fall behind. If a car title loan is your only option, you should compare lenders to see who has the best rates and terms. Instead of just accepting the first offer you find, read the fine print of multiple lenders. You can visit the loan store in person or fill out an application online for many car title loan companies. You’ll need to fill out the paperwork, show a photo ID, and proof of insurance. You’ll also have to bring in the title showing you own the vehicle outright with no lien against it. Once you’ve been approved for the loan, you should read the details before accepting it. Many people make the mistake of believing they must accept the loan if they are approved. Until you sign the actual loan agreement, you are under no obligation. Review the loan terms to make sure they haven’t changed from what you thought they were when you applied. Sometimes, a lender will show the lowest cost or best APR, but you will be approved for a higher APR or other terms. The reason for the discrepancy may be legitimate, like if you borrowed a larger amount, but you should still be aware of the changes. Pay attention to the paperwork you sign. In addition to the actual loan document, the lender may require you to purchase other add-ons. For example, they may say you must have roadside assistance or other amenities for your loan. Take these added expenses into consideration before agreeing to the loan terms. Most car title loans only last for a short period of time. If you can’t repay the loan, it rolls over into a new loan. More fees and interest are added to the loan, increasing the cost. Traditional lenders allow you to pay over time, such as six or 12 months, paying some of the balance along with the principle. While the interest rate is still high, it is often lower than the other type of car title loan. Another option with some lenders is an interest-only payment. You’re only required to pay the accrued interest until the final payment, which is when the entire balance is due. The danger with this option is that it gives you a false sense of security that you can make the minimum payment. The issue arises when you have to pay the loan in total. You’ve been making payments for months, and yet you still owe the entire amount you borrowed. In some situations, you may be able to defer one or two payments and just pay the interest. This extends the life of your loan, but it can help if you’re short on funds. While most lenders prefer to have you sign up for an automatic debit out of your bank account, you aren’t required to do so for approval. The biggest danger of car title loans is what happens if you can’t pay back what you owe. The lender can begin repossession of the vehicle. This can happen at any time, depending on the terms of your loan. It is legally allowed if you default on your loan. What constitutes a default is defined in your agreement. If you know you’re going to have trouble making a payment, contact the lender before it is due to find out your options. It can help prevent you from losing your car. 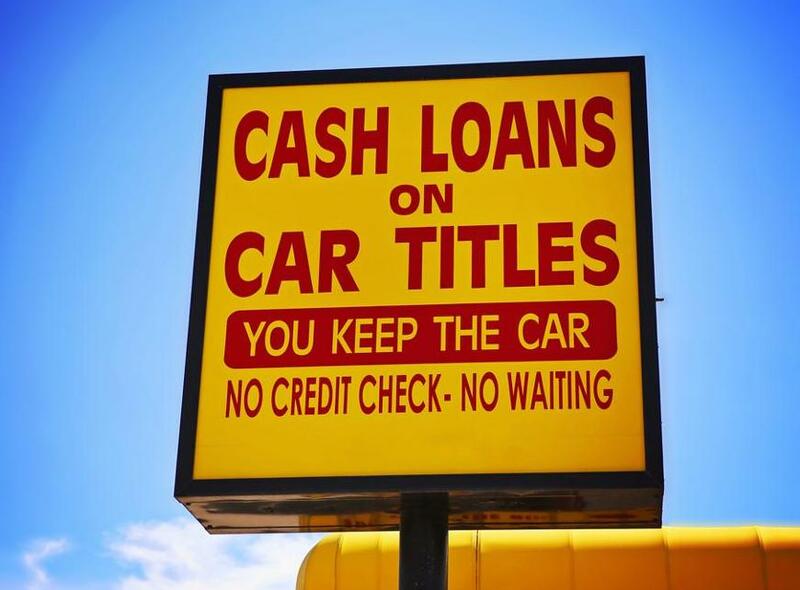 Are All Car Title Loans Bad? If you’ve read anything about car title loans and the companies that provide them, you know they are often considered to be predatory lenders. They prey on people with low credit scores and very few options. In many cases, lenders take advantage of these customers, knowing they can never afford to pay back the loan. However, not all loan companies that provide title loans are bad. Those that fall under the better group of title lenders still charge high interest, but it might be in the double digits instead of triple digits. They offer a longer term, allowing you to pay off the loan a little at a time. You might even find a loan term longer than 12 months, which could offer payments that you may find more affordable. While most loan companies are not the ideal choice for anyone seeking money to pay bills or to make a purchase, some lenders are better than others. It may take some effort and time, but you can find these lenders with a little research. Look for companies that offer affordable terms and multiple options. Before you decide to seek out a car title loan, make sure you have no better alternative. Research companies and choose the one that is the best fit for your needs. Avoid those that seem to make you destined to fail because you risk losing your car if you default on the loan. Taking on any kind of loan isn’t a decision that should be made rashly, and a car title loan is certainly no exception.